June 8, 2012, 11 a.m.
By Justin Ellis @JustinNXT June 8, 2012, 11 a.m. When newspapers cut back on their print product it’s big news. When the New Orleans Times-Picayune — not to mention three other Newhouse newspapers in Alabama — announced it was reducing its print production to three days a week it was like the shot heard around the (journalism) world. And yet, that same day up in Eugene, Ore., another paper announced it was pulling back to two days of print and made it sound like a triumph. The Daily Emerald has been publishing five days a week for over 90 years and now, like the handful of papers who have cut back on print before it, plans to beef up its web presence and find new digital ways to reach their readers. So this fall, when students return to campus, the Daily Emerald will be officially replaced by Emerald Media Group. Under the new plan, the paper will be published on Mondays and Thursdays, two high traffic days on campus. The Monday edition will focus on longer news pieces and sports wrap-ups; Thursdays will have an emphasis on arts and entertainment (and, again, sports). The design of the paper is being completely overhauled; shifting from a broadsheet to a tabloid. They’re also adding an app development lab called The Garage and plan to extend themselves beyond advertising into marketing services and events. Whenever a newspaper shakes up its production model, it runs the risk of shedding readers. As much as the Emerald’s target audience is of an age not known for reading print, the physical ritual of picking up a paper still has meaning. Frank told me they’ve received plenty of feedback from students that amounts to “the only reason I read the paper is because I can pick it up on the way to class.” At the same time, he said the Emerald hasn’t done extensive surveys on student’s likelihood of reading news online or on devices. In other words, the risk is real. “From what I’ve seen, what I know, and what I’ve learned about students since I’ve been here, I honestly don’t know what kind of success we’ll have reaching them with news specifically on web and mobile devices,” he said. But Frank says, even if times aren’t bad now, he expects the Emerald’s trend line for the print paper will be the same as others: Advertising will decline. The Emerald doesn’t get support from the university, which means they had to be proactive. At the same time, the paper’s mission is two-fold; keep the university community informed and prepare their staff for a career in the journalism business. Using that frame, thinking of a student newspaper as a “teaching hospital” for journalism, Frank said they had to change. “Our approach has been let’s teach our students and ourselves how to deliver what the readers want, because that’s going to be demanded of them when they leave this office,” Frank said. The Emerald has a staff of around 80, most of them students, many getting a small stipend for their work. Under the new plan, a handful of reporters will be assigned to the “speed team,” a group, Emerald Editor-in-Chief Andy Rossback said, responsible for chasing breaking news and updates for Dailyemerald.com. Rossback said they want these reporters to post breaking news as it happens, even if that means bypassing editors for expediency. Elsewhere on the staff, Rossback wants to create thematic beats to encourage deeper coverage for things like student debt, public support for education, and the relationship between college athletics and sports business. (That’s something of particular interest given Oregon’s deep ties to Phil Knight and Nike.) “We want people to spend nine months on the beat and they’ll become experts in it,” Rossback said. With the change in print, Rossback expects to see more enterprise pieces, with an emphasis on news on Mondays and features on Thursdays. Of course, since it’s a college paper, some things won’t change: The police blotter is not going anywhere. “We’re shifting to this idea of what does the reader want, not what do we think the reader needs, which has been the journalism philosophy for years,” he said. As they prepare the staff for the transition, Rossback said they’ve discovered that learned journalism habits can be hard to break, even for 20-year-olds. Even for a staff that embraces technology and is familiar with online journalism, change still takes getting used to, he said. “We can come up with a plan and set it out on the table, but the execution of it is a process that is going to take time,” Rossback said. 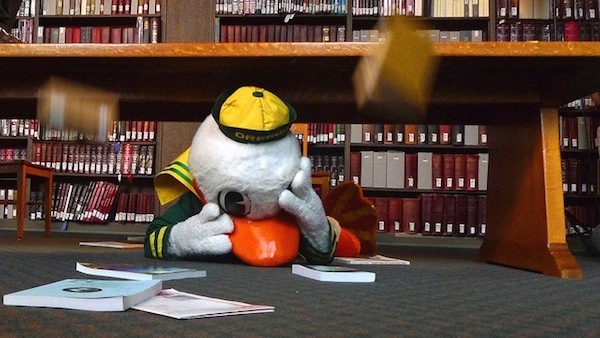 Image of the Oregon Duck by Wolfram Burner used under a Creative Commons license. POSTED June 8, 2012, 11 a.m.